There’s one thing all the neighbors can agree on along the 600 block of 14th Street in Northeast D.C.
“It’s a good conversation with the neighbors. ‘Ohh, the pothole,’” said Angie Flottemesch. She said the medium-sized hole near her row house was the first thing she noticed when she moved into her home. "We had a moving truck that day and they almost got stuck in it," she said, calling it “a natural speed bump” because everyone slams on their brakes when they see it. It’s just one of almost 40,000 potholes D.C.'s Department of Transportation says it will need to fix this coming year. DDOT’s Reginald Arno told us they tackle “395, 295, 695 first. And then we'll go look at the New York Avenues, the Massachusetts Avenues, and then we go to the side streets from there." D.C.’s Department of Transportation says we’re headed straight into the worst stretch of pothole season. The News4 I-Team hit the streets to show you the newest technology and how long it really takes to fill a pothole, and we mapped them all out to show how your pothole compares with the rest of the city. He explained the same men and women who plow your snow and repave your streets also fill your potholes. Arno said potholes form when water finds a way to get under the pavement and into the soil. When it freezes, it pushes the soil up at a weak spot and leaves an air pocket under the pavement when it thaws. That air pocket then cracks into a pothole when you drive over it. 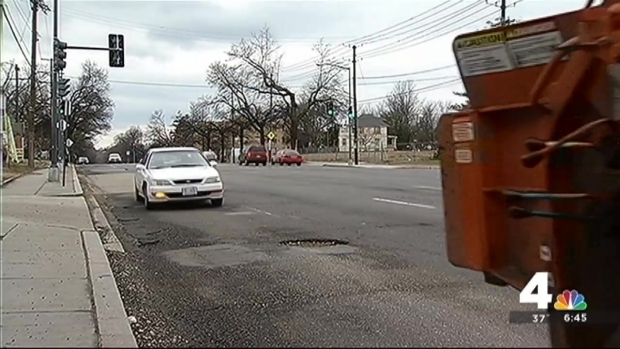 When the News4 I-Team analyzed a database of all 311 calls for potholes from July 1, 2012, until last week, we found DDOT does make its 72-hour goal about 71 percent of the time. We calculated how long it took for each hole to be repaired and made the map above for you to search the ones near your home and on your commute. The data shows about 59 percent of the calls come from Northwest. Only 3 percent come from Southwest. But we found some potholes can linger unfixed for weeks or even months. Like two we discovered on Quebec Place in Northwest, which records show went 272 days before getting patched last summer, only to break back open a few months later. Or the rough patch at Rhode Island Avenue and Hamlin Street in Northeast, which data show went untouched for 356 days, almost an entire year, before being closed out of the system. Once again, the holes are already beginning to reappear, neighbors said. "They are like vampires, they never die unless you put a stake in their hearts and so they always come back and that's the problem," said John Townsend with AAA Mid-Atlantic. He told the I-Team potholes can cause thousands of dollars in damage ranging from broken rims to full-fledged accidents. “Drivers try to swerve to avoid the pothole or hit the pothole and then hit the brake to avoid more damage and someone will rear end them," he said. Which is why DDOT is trying something new this year, Arno said. He invited the I-Team to watch as his crews tackled a particularly bumpy stretch near Alabama and Branch avenues in Northeast. Some of the guys followed behind a large truck spewing the old-fashioned asphalt mix they’ve used for years. But others hauled bright orange buckets of Aquaphalt, a new mix that bonds with groundwater. "We want a side-by-side comparison to see how well it holds up," Arno explained. His crews are circling the holes filled with the new blend with white paint so they can watch how well they weather over the next few months because Aquaphalt costs three times as much as the old stuff. "Even if it's more expensive, if we don't have to come back out here to maintain that, it's a win for us." But Arno said the reality is some roads are so cracked and pot-marked, only repaving them will truly get rid of the groundwater and permanently fix the problem. "This treatment we're doing is more of a band aid," he said. City records show someone called it in to get repaired 315 days ago, and they’re still waiting for a fill. "It's kind of annoying," Flottemesch said. When we asked about it, DDOT told the I-Team they've waited so long because DDOT determined the pothole "required more extensive road resurfacing." Meaning that pothole that never goes away could be a sign of a smoother ride headed your way.